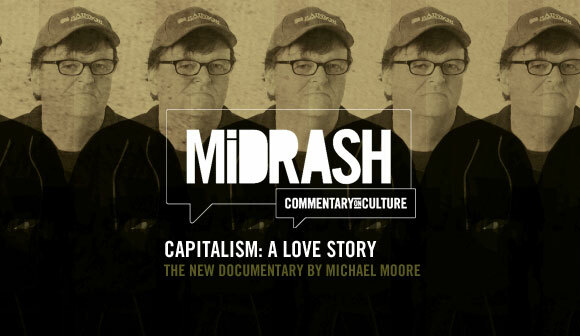 i’m excited to announce the next midrash event—a film night—in which we will be viewing and discussing michael moore’s latest film, capitalism: a love story. whether you love him or hate, moore keenly understands how to make a movie that demands lengthy discussion and hearty debate. in this movie, moore asks tough questions about our nation’s economic system and also proposes that some people hold capitalism in the same regards, if not higher, than their religion. considering moore’s other movies—sicko, fahrenheit 9/11 and bowling for columbine—this promises to be a very compelling movie. I have come to believe that there is no getting around the fact that capitalism is opposite everything that Jesus (and Moses and Mohammed and Buddha) taught. All the great religions are clear about one thing: It is evil to take the majority of the pie and leave what’s left for everyone to fight over. Jesus said that the rich man would have a very hard time getting into heaven. He told us that we had to be our brother’s and sister’s keepers and that the riches that did exist were to be divided fairly. He said that if you failed to house the homeless and feed the hungry, you’d have a hard time finding the pin code to the pearly gates. so, this is sure to be a good conversation that should warrant insights into both theology and politics. here’s a few quick details. we’ll gather at market street cinema this wednesday, october 7 where the movie starts at 7 p.m. (of course, you’ll want to get there a few minutes early to grab a cold beverage). it lasts a little over 2 hours and at its conclusion, we’ll head over a couple blocks to java roasting company to discuss what we’ve seen. this should be a movie fit perfectly for a midrash film night, so don’t miss it! and invite a friend! see you there. One of the nation’s, if not world’s, most provocative movie producers is touching an extremely volatile third rail in his newest movie, \”Capitalsm, A Love Story\”. In this movie Moore asks tough questions about our nation’s economic system and also proposes that some people hold capitalism in the same regards, if not higher, than their religion. Considering Moore’s other movies (“Sicko”, “Fahrenheit 9/11”, and “Bowling For Columbine”) this promises to be a very compelling movie. How important is capitalism to you? How important is capitalism to our nation? Should capitalism be the economic system of our nation? How does capitalism affect our religious beliefs? Can you be a Christian and be a capitalist? These questions and others will be discussed when we get together after the movie. The exact start time for the evening is not officially set yet because Market Street Cinema has not released the show times for the movie. The plan is to watch the movie and then discuss it as a group afterward. We’ll either discuss the movie in Market Street Cinema or mosey a couple blocks east to Java Roasting Company. Check out the blog for when we’ll meet at Market Street Cinema. Come on out, grab a brew (yes, Market Street Cinema serves wine and beer! ), share your view, and lend an ear to others’. How Important is Capitalism To You?